Femarelle Menopause Support is a natural supplement for treating the symptoms of menopause based on a class of compounds named Selective Estrogen Receptor Modulators. Unlike hormone replacement therapy that is based on lab obtained hormones to help women regain their hormonal balance when they reach menopause, these SERMs are obtained from natural sources. In the case of Femarelle Menopause Support, it is obtained from soy, and it is advertised as being effective in treating the symptoms of menopause, such as hot flashes, mood swings, vaginal dryness, sleeplessness and night sweats. 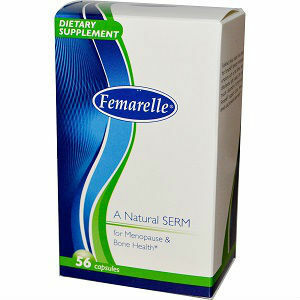 The manufacturer also promises that Femarelle Menopause Support also contributes to bone health. Let’s see what this product contains and how it can help relieve the symptoms associated with menopause. What Does Femarelle Menopause Support Contain? Compared to other similar products on the market, this formula does not seem very strong. Soy is known to be rich in isoflavones, compounds that help relieve inflammation in the body and contribute to hormonal balance, and flaxseed is also good for overall health. Not many conclusions can be drawn from this unique formula, except that it may be helpful in reducing hot flashes. The recommended dosage is two capsules daily, one taken in the morning, and one in the evening. A bottle with 56 capsules is sold for 29.8Euros, which is an average price for such a product. We did not see any clear money back guarantee being offered on the manufacturer’s official website. However, you can contact them directly for any questions you might have about the product or your order. Femarelle Menopause Support has been on the market for 12 years, which says something about the product’s popularity. Its formula is a combination of an unique soy compound and flaxseed, both effective in treating some of the symptoms of menopause. However, there are other similar products on the market that combine more powerful ingredients so the whole array of symptoms accompanying menopause can be addressed. Jackie Horowitz	reviewed Femarelle	on February 25th	 and gave it a rating of 2.